I am so happy to have you here and look forward to seeing what you have been up too. You’ll find the link to join the party at the bottom of this post. to get the Open House button above posted. Enjoy the party and please take a few minutes and visit some of the other links. I had problems last week with loading pictures…. What wonderful treasures are yours in celebration of your birthday, Sherry. Happy Belated!! p.s. Please join me in celebrating my first blogiversary…there are giveaways each day, too. Thanks so much for hosting! It's Holy Week for Greeks all over the world and I've been preparing the house and baking traditional sweets. I know you visited Greece in the month of September, but if you ever get a chance again, you will be truly enchanted with the festivities of Easter, especially, on the islands! Hi Sherry, Thank you for hosting each week. Hi Sherry! I just found your blog looking for chalk paint recipes… So glad I stumbled on you… I am your newest follower and I linked up a garden post! thank you for hosting..
Do come visit Dandelion House Soon! I host the Farmgirl Friday Blog Hop every Friday.. all are welcome! I'm so glad that I stopped by to see all these wonderful posts. This is a great party! I loved seeing your birthday gifts! 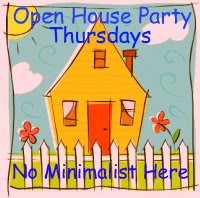 Happy Open House Party day! Looks like you're going to have a hard time picking features this week! Thanks for another great party! You can show the pictures for TWO weeks now! Hopefully the Blogger issue will clear up! Sherry, Thanks for hosting each week. Such inspiration to be found here! Hi Sherry, I'm a little late but I'm glad to be here. Thanks for hosting this wonderful party. Linked up a little late but wanted to join in. Appreciate you hosting each week! Thanks for hosting Sherry. Hope you have a fabulous weekend! Thanks for a wonderful party!!! Love the numbered napkins.